Waymo today plans to announce its driverless vehicles have been operating on US roadways for weeks with total freedom. Tesla recently told shareholders it was on the verge of updating its Autopilot software for full autonomy. And Las Vegas will tomorrow become the first city in history to offer the public a ride in a completely driverless shuttle on regular roads with real traffic. We’ve officially entered the age of level four autonomy for driverless cars. On Wednesday November 8th the general public will have the opportunity to ride through a half-mile stretch of Las Vegas in a new shuttle built by French AI company Navya. The shuttle is autonomous; it doesn’t have a steering wheel or brake pedal. It’s being operated by non-profit American Automobile Association (AAA) as part of an initiative to help spread positive awareness for the technology. The vehicle has a top speed of 40 km/h (25 MPH) but will likely only operate at 16-32 km/h (10-15 MPH), so it won’t be winning any races. It does communicate with traffic lights and it’s guided by GPS and a camera system. It’ll carry up to 11 passengers at a time and the rides are free of charge. Even better, AAA will donate one dollar per rider, over the next year, to the Las Vegas Victims Fund, which was set up to provide aid for victims of the October 1st mass shooting. This is the next stage to see if autonomous vehicles have any conflicts with real-time traffic, which will help us determine if this technology can be rolled out on a longer term. If you’re taking a trip to Vegas to ride the shuttle we highly recommend you stop off in Phoenix, Arizona while you’re in the area. Waymo’s amazing fleet of driverless cars are on the roads right now, sharing them with pedestrians and other cars. In the following video we see humans trusting machines with their lives. The footage is amazing and it’s impossible to overstate how important to humanity this is. There are 1.2 million lives lost every year because of human error while behind the wheel. 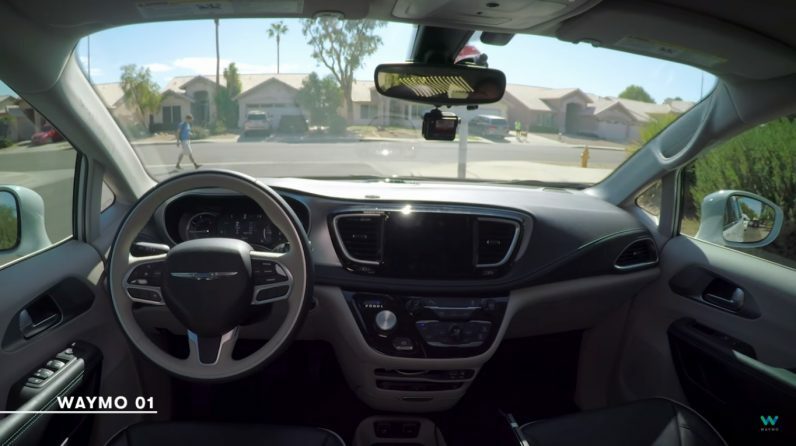 This simple YouTube video shows us that driverless cars are a reality right now, and that means we have the technology to potentially save those lives. Reaching level four autonomy is a huge accomplishment, and both Waymo and Navya should take great pride in making history. At level four a vehicle has no need for a steering wheel or pedals; it can operate to its full functionality without a human being inside of it. The next stage, level five, would involve a vehicle that doesn’t need to connect to the cloud, GPS, the traffic grid — or any other form of external information. If you ask us, level five is overrated. The ability for a vehicle to communicate with the cloud seems pretty important right now. We currently have vehicles on US roadways operating without any human direction whatsoever. Of course safeguards are certainly in place, and in these continuing tests people are inside the vehicles in case a “pull over” button needs to be pressed. For all of us who’ve eagerly awaited the future when artificial intelligence would become so advanced that we could achieve truly driverless cars: TNW is happy to report your day has arrived.